Yesterday morning I caught the early bird showing of the new movie “Exodus: Gods and Kings,” directed by Ridley Scott. Regular readers of Funmurphys: the Blog already know that I have written and published a new book about the Hebrew Exodus from Egypt, focusing specifically on crossing the Red Sea. The book is titled: Between Migdol and the Sea: Crossing the Red Sea with Faith and Science (2014), by Carl Drews. This review is written from a book author’s perspective. A good biblical epic should provide jaw-dropping spectacle and majestic grandeur. Exodus: Gods and Kings provides these in abundance! Some of the earlier scenes show the great sweep of the Nile delta, with pyramids rising along the banks of the great river, while Bronze Age citizens bustle about under the stern watch of the Pharaoh’s foremen. Ancient Egypt was a marvelous place! This movie really brings out the grandeur of the New Kingdom in all its glory. The Ten Plagues are depicted graphically in the film, and the result is disturbing. A week ago I would have not imagined an infestation of frogs to be all that bad, but I just about jumped out of my theater seat to see all those slimy amphibians crawling over everything! Yuck! Then there came all manner of flies, more flies than I have ever seen even in Alaska. We saw the movie in 3-D, and we were recoiling and trying to get out of the swarm. The plagues are very well done by the cinematographer. Exodus: Gods and Kings brings out a theological point: During the Ten Plagues, a lot of people suffered greatly. According to the narrative in Exodus, Pharaoh suffered because he refused to let the Israelites go. Ridley Scott makes the point that many common Egyptians suffered as well, through no fault of their own. What kind of god would strike dead all the first-born sons? Modern Christians continue to feel uncomfortable about these episodes, and we debate various resolutions. Generally we conclude that Jesus doesn’t do things that way any more, and we follow Jesus. God Almighty is portrayed in Exodus: Gods and Kings as a boy about 8 years old with a British accent. I can accept God speaking to Elijah as a “still, small voice” in 1 Kings 19. I believe that God became incarnate in the baby Jesus Christ, born in Bethlehem. But the surly attitude of the God-boy in this movie was jarring, and I was left wondering why Moses would accept the commands from such a manifestation of the Almighty. At least the boy should have had more gravitas, and should have spoken to Moses with graceful majesty. Was Morgan Freeman not available? There is a scene in The Hobbitt: An Unexpected Journey where Gandalf and the dwarves kill the Great Goblin and escape from the underground goblin kingdom. When my family watches this sequence at home, we usually keep a body count of goblins, yelling out the numbers as they fall. Our total usually comes out to about 140. During the pursuit of Moses by the Egyptian army, Rameses II charges with all his chariots down a narrow mountain road after the fleeing Israelites. Naturally some careless chariot driver careens off the edge and tumbles down the mountain. Then another chariot hits a rock, and within a few moments there is a huge landslide about 30 chariots behind Pharaoh, and all the remaining vehicles in the column either tumble to their tragic and untimely deaths, or are blocked by the now-impassable road. So – Rameses is left with about 30 chariots out of the 1,000 that departed the Egyptian capital. 400,000 Israelites ought to be able to make quick work of them. But when Pharaoh reaches the beach somehow all his 1,000 chariots have miraculously re-appeared. Someone was not counting properly! Yeah, I know it’s just a movie. But I was chuckling over the movie’s continuity error while still enjoying the action. And the action in Exodus: Gods and Kings is superb! At one point Moses brings out a hand-written map showing his planned route from Egypt back to his wife Zipporah in Midian. Maybe nobody else in the audience cared, but I instantly recognized the route after studying that geography for five years. Moses, generations of biblical scholars would gladly trade several chapters of Leviticus for just one glance at your map! The traditional route of the Exodus is generally agreed, but there are other proposals. 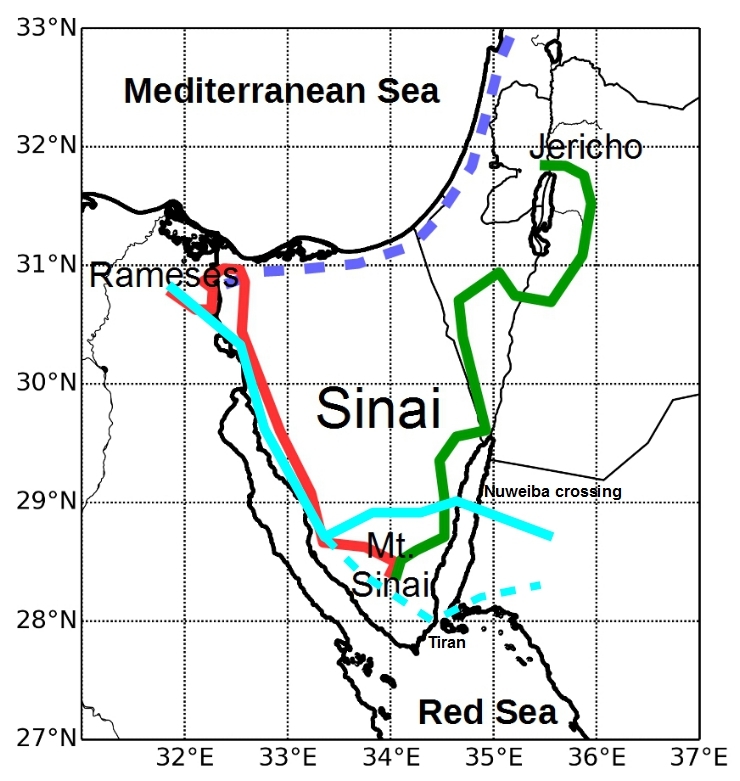 Between Migdol and the Sea (Drews 2014) Figure 11-1 with lines added in cyan showing routes from the movie Exodus: Gods and Kings (2014). Copyright 2014 by Carl Drews. My book Between Migdol and the Sea (Drews, 2014) provides a map of the Sinai peninsula in Chapter 11 (right). The traditional route is marked here in red and green. In Ridley Scott’s Exodus, Moses plans to take the cyan (light blue) route down the west coast of Sinai and cross the Straits of Tiran (dotted cyan). But he takes a detour through the Sinai mountains and gets stuck at Nuweiba instead (solid cyan). In the movie the Israelites cross the Red Sea from Nuweiba over to modern Saudi Arabia. There are a couple of problems with this scenario. An earlier scene shows Moses splashing across the “Straits of Tiran” on his way to meet Zipporah. But this strait in real life is not like Adam’s Bridge across the Palk Strait from India to Sri Lanka, oh no! The Enterprise Passage in the Straits of Tiran today is 250 meters (820 feet) deep. [Between Migdol and the Sea, page 179] Nobody will be splashing across there. The underwater ridge at Nuweiba is 765 meters (2,510 feet) deep. [Migdol, page 179] That would be quite a hike. This little vignette was actually pretty funny, especially for me. Rameses is getting understandably tired of the Plagues, and he calls in various advisors to learn how to stop the plagues, or at least to predict when they will end. Bad advice results in immediate execution. One of these advisors is a Scientist who has not taken the seminar on How to Communicate Science. He gleefully launches into a technical discussion of how the crocodiles churned up the water and made it turn red, how all that extra sediment caused the fish to die and the frogs to multiply. Rameses knows this already and scowls at Scientist, wondering when he’s going to come to the point. “And what comes next?” asks the Scientist happily. “Flies!” retorts Rameses in disgust, swatting at the hundreds of flies swarming around him. “Yes!” answers the Scientist, obviously pleased that his students are following the lecture. The next shot shows the Scientist on the scaffold about to be executed. In science communication we talk about Framing the Message. Framing means to go beyond the facts; your audience wants to know why these facts matter and how they are relevant to their own concerns. In climate science, a government audience wants to know how society will be affected, not just how many degrees the temperature will increase. In Exodus: Gods and Kings, the parting of the Red Sea is accomplished by a flaming meteorite that falls into the sea beyond the horizon. This impact causes a tsunami in which the sea draws back for the Israelites to cross, then returns in a giant wave while the Egyptian chariots pursue. In the movie God sends the meteorite at the right place and time for Moses to lead his people across, so of course this is full-on theistic astronomy. Ridley Scott does not fall into the “God of the Gaps” fallacy that seems to plague certain atheist bloggers! Good for him. The Bible says the east wind drove back the water all night long (Exodus 14:20-21). But would a meteorite impact also work? The answer is: not likely. For the 2004 Indian Ocean tsunami that struck Indonesia, there were three huge waves over 1.5 hours. The wave period from drawback through the return surge was about 30 minutes. There have been some tsunamis with a longer wave period, but the basic wave cycle is measured in tens of minutes, not hours. At the Nuweiba crossing Moses and the Israelites would have to descend 2,500 vertical feet and then crank up the other side back to sea level, all in 30 minutes. The Colorado Mountain Club uses 1,000 feet per hour as a rule of thumb when climbing fourteeners (Between Migdol and the Sea, page 166). A tsunami simply does not provide enough time to make the crossing. But the wave action is spectacular! Exodus: Gods and Kings does action very well. This entry was posted on December 14, 2014, 7:32 pm and is filed under Books, Carl, Current Events, Faith, History, Media Criticism, Movies, Science, Uncategorized. You can follow any responses to this entry through RSS 2.0. You can skip to the end and leave a response. Pinging is currently not allowed. Glad you liked the movie. Thanks for the review. It’s obvious you really know what you’re talking about. I’m looking forward to my first viewing.